As the MONTANE Spine Race enters its third night, Paris, first placed female, has forged ahead of 2013 MONTANE Spine Race winner, Roselló Solé, first placed male. Both Paris and Roselló Solé started the day by increasing their lead over Eoin Keith (IRL). They continued to run together until they reached CP4 at Alston, 194 miles into the race. However, even though they elected to rest, Paris pushed on ahead of Roselló Solé after just 45 minutes. 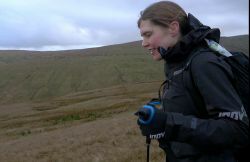 She built up a commanding lead of almost seven miles before Roselló Solé rejoined the Pennine Way. The weather has been milder today with temperatures around 7°C and a wind chill of 4° C, cloudy with intermittent showers later in the day. Tomorrow Snow is forecast on Cross Fell between 10AM and 11 AM (heavy)then potential for light snow turning to sleet later. Windspeed 25mph gusting to 50mph with windchill of -10° C. On Cheviots forecast is for a mixture of rain, snow, sleet and fog throughout the day. Windchill is expected to be as low as -11° C.